Wednesday night I attended a seminar about communicating with children and how parenting in the world we live in has serious challenges. 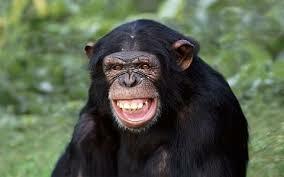 I learned that when I’m speaking to my 15 year old, I’m basically talking to that chimp in the picture. No joke. It all made sense! I found out that their prefrontal cortex (the part of the brain that allows you to think before you act) doesn’t fully develop until they’re 25-31!!! They think with the limbic region which is the part that recognizes pleasure/pain and attention. Then you throw puberty into the mix and yes, I’m raising a chimp for 10 more years. If you’re reading this and thinking, “Poor Blake, his mom is calling him a chimp online!” Don’t worry…I told him all this in the car after practice that night. His response with a smile, “Yeah mom, I’m not great at thinking before I act.” True story. But I still love him with all my heart. *Children spend 1/3 of their day on technology. 8-10 year olds spend an average of 5 hours per day on it. Screen time is not imaginative play. Kids need to be bored without putting screens in front of them. *Kids need to feel listened to, not just talked at. It’s important to use a level of listening that focuses on what THEY’RE saying, not what YOU want to say next. *They need models not lessons. Do you model good listening? Kids need parents to model verbalizing feelings and emotions, not parents who teach through sarcasm and humiliation. *When dealing with an angry/upset child, it’s like dealing with a wild animal. They feel threatened and backed into a corner when you come at them with reasoning in that moment. Help them calm their body and talk about it at a time when they are able to reason. *A teen that is stressed sees everything as a threat. Teen stress is higher than ever. Technology plays a big part of this. Every heard of FOMO…fear of missing out? Snapchat, Instagram, Facebook all increases FOMO in teens (and adults). Teens compare their lives, bodies, social status, standard of living amongst much more through these social media avenues. Provide love and affection even through challenging moments. Help them learn how to navigate stress. Have boundaries and stick to them. Make sure they feel safe and talk about what to do when they don’t. MODEL, MODEL, MODEL EVERYTHING ABOVE!!! Thanks for reading! As parents, talk with other parents and continue to be a learner around raising your kids.